I find the rendering rather Seiko-like. Not for me. Yes to this. The design is a proven winner, is it not? No logo, no date, perhaps crisper print consistent colouring between the numbers and the lume, and perhaps a fraction slimmer if possible? Perfect. 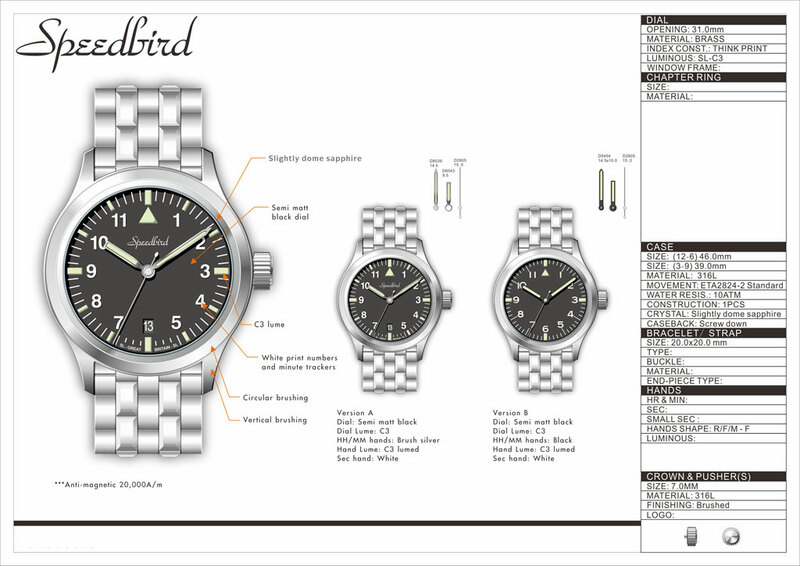 The bracelet was awesome on that older Speedbird but I always thought it overpowered the watch a bit. So would like to see a bracelet more suited to it if going with the older design. Last edited by James_; 31st August 2017 at 16:31. As a matter of interest are those saying "More like the old Speedbird" owners of older Speedbirds? I really liked the render (I like the red, the numerals and the hands, although the date window looks a little out of proportion), but I've never really felt the urge for a Speedbird. I can see what people mean about "Seiko Dress Watch" style, a little, but I'm sure in the metal it'd be distinct enough not to be mistaken for one. A non date option with drilled lugs, double AR and a tapered bracelet please. An internal bezel version of the original would have me buying one. Will the bracelet taper towards the clasp? Was this project discarded or is it still underway? I'll make more of the Speedbird 3 at some point and for the 20th anniversary of the PRS-1, I'll make some with the PRS-1 dial or maybe a full reproduction of the PRS-1 (20th anniversary edition). Eddie, I don’t envy you trying to follow the brilliant SB3. I have had mine a few years now and I still much enjoy wearing it and consider it was an absolute bargain! IMHO the bracelet alone is pretty much worth what I paid you for the SB3 package! I'm a Speedbird fanboy. I'll buy just about anything that says Speedbird so long as it's no more than 40mm. SB1 re-issue? Yes, please. Shame, I really liked the look of this one. Nice sporty dress watch with a bit of style to it. 20 years...where has the time gone! I will order some if you make some. I am a newcomer, totally missed out the chance to buy last time. Otherwise, I will have to get it from MKII. Love the font on the version B. Prefer it to my original version. Personally i prefer the sterile dials. I love that dial though Eddie and i think if you ever got round to producing a 60 min timing bezel version with that dial you would have a winner. The slightly squashy font reminds me of the heuer bund, which is a good thing. Last edited by seikopath; 5th June 2018 at 08:07. The hands are black on the PRS-1. Version B for me Eddie. I really like the black hands over the black dial and the fact it doesn’t have a date. Love the font on the version B.
I like version B too. That looks fantastic! Would you estimate it to be a 2018 or a 2019 model? I like both versions however the main improvement would be a bracelet clasp with micro-adjustment. The SBIII is arguably the best watch I’ve ever owned but I’ve owned and sold three due to the butterfly clasp fastening. Version B all the way! Good call,same choice for me. Will there be an adjustable clasp? I could never get a good fit on my SBII GMT. Perfect ... Where can I sign up! Version B looks fantastic, might even sell my PRS-22! This without a date would make a nice sporty dress watch. Not a Speedbird obviously but would be a nice addition to the range! Can you do a 3-6-9 mock up without a date? Show me the type of clasp you mean and I'll look at it. A fliplock will give the required micro adjustment that the butterfly doesn’t offer. how do they compare to the sbiii? 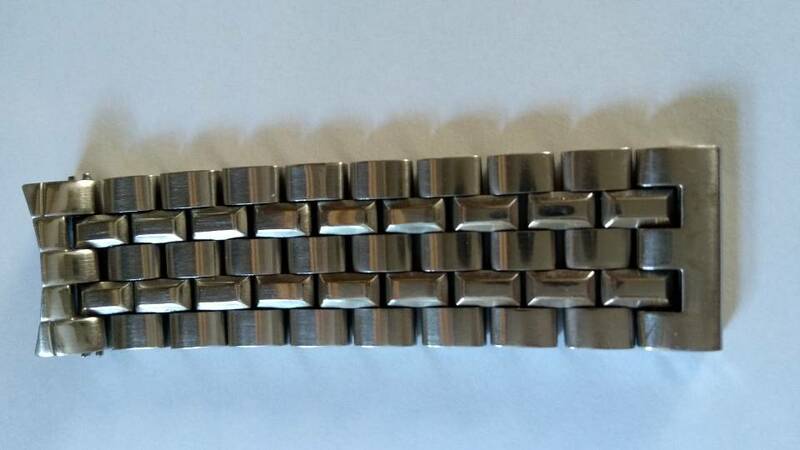 Like the IWC Pilot bracelet clasp with ratchet? 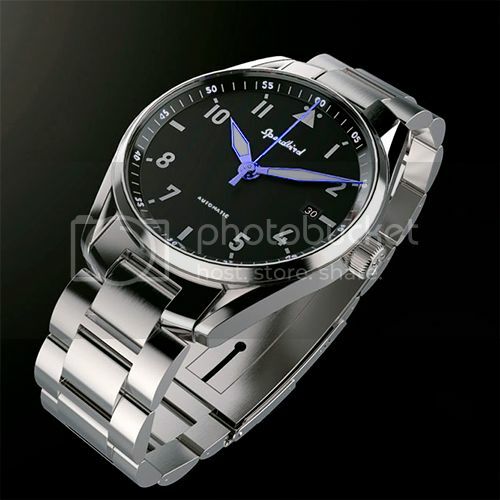 I know this is a recent IWC invention, but is something similar available? I was just scouring the web for a Speedbird III but having seen version B i'm than happy to wait. Looks brilliant. Version B looks perfect; include two sets of lug holes, one for the bracelet, one for the strap, and it will be. The lack of the latter is a weakness in the Speedbird 3. 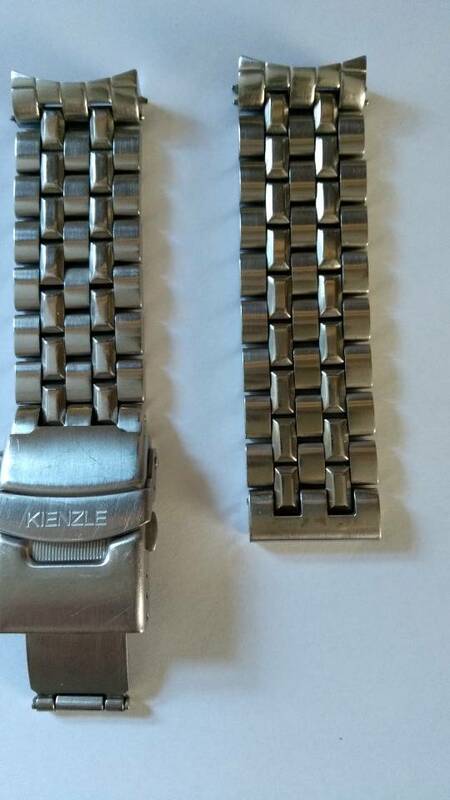 I've used clasp end links from a Kienzle bracelet that matches up to the Speedbird bracelet and enables fitting a standard adjustable safety clasp. Version B looks like a winner Eddie. I too like the idea of a micro adjustment on the bracelet. Has anyone noticed that the "Version B" looks larger (it's not)? Only on reviewing your drawings following your prompt. An optical illusion as a consequence of the finer minute markers perhaps? Would it be feasible to offer two variants - logoed and sterile dial, as Stowa do? The date was the only thing wrong with the sterile Speedbird I had for a while. No date and I'm convinced I'd still have it. I like the black hands. It doesn’t lose any legibility because the lume covers most of the hands anyway and therefore appears to “float” over the dial. Speaking as someone with no knowledge as to what's appropriate or not on this style (and who in any case has his fingers crossed for the possible white dial 29a) I could imagine version B's numerals with Version A's handsome logo and date window, together with a rich satin or glossy dial texture, having commercial appeal to uninformed people like myself. The 39mm diameter, bracelet, auto movement and 10atm WR also on the nose for that kind of customer. I am guessing that is an optical illusion, the result of the B version having larger numerals and a smaller triangle. ...I could imagine version B's numerals with Version A's handsome logo and date window, together with a rich satin or glossy dial texture, having commercial appeal to uninformed people like myself. The 39mm diameter, bracelet, auto movement and 10atm WR also on the nose for that kind of customer. As you wish: PLEASE! NO DATE, NO LOGO, NO TEXTURE AND NO GLOSS ON THE B VERSION! Consider yourself shouted down. :) I am okay with that stuff on the A version (which I won't be buying). If I were to change anything I would use BGW9 lume instead of C3 lume. BGW9 is a white lume and has 95% of the luminescence of C3 without the greenish cast C3 often displays. I would also prefer matte silver hands rather than black. Regardless of my nit-picking I am quite pleased with the B version, it is a handsome watch. Give me a B! B! The "b" is looking perfect, i know it would probably add significantly to the cost but what would really make this one special would be to make it a true no date watch. I don't know how practicable that is. I do know that feeling the date stop in the crown movement and having no date to set has ruined some otherwise great watches for me.